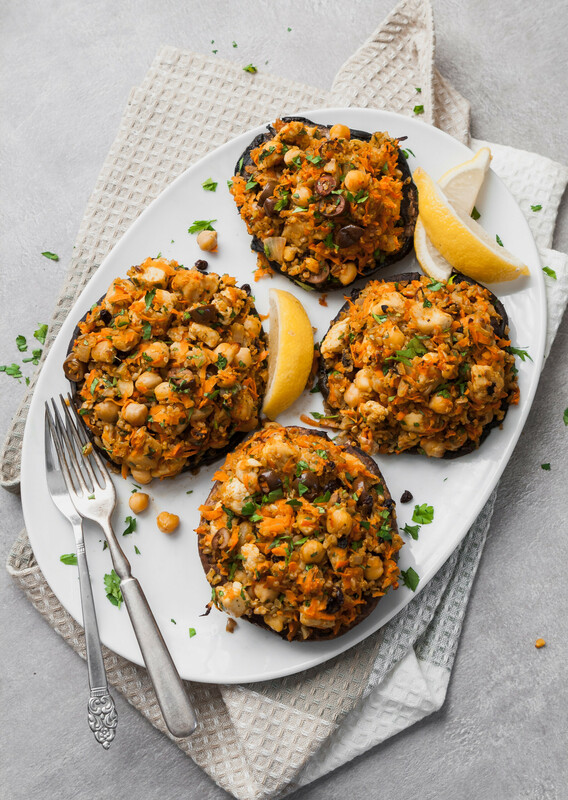 Packed with bold flavors and textures, these Moroccan Stuffed Portobellos with carrots, chickpeas, and ancient grains are not only healthy and satisfying, but easy to make and come together in under an hour! Welcome to the fourth seasonal collaboration organized by lovely ladies, Rebecca, Ruth, and Annie of Square Meal Round Table and What’s Annie Eating! This is the second collaboration I’ve been apart of, with the first resulting in this gorgeous Puffed Apple Pancake. 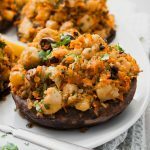 This time around, carrots are the star of the show and I decided to make use of their natural sweetness in these Moroccan-Stuffed Portobello Mushrooms. Although carrots tend to be sweetest in the fall they’ve proven to be a staple in winter dishes for a myriad of reasons including their hearty texture and longevity when it comes to storing. Check out the tips for purchasing and storing carrots below, then browse some of the carrot-heavy recipes from fellow blogger participating in this #24carrotgoals collaboration! Look for carrots that are firm in texture, stiff, and not bendable. Avoid any bags of carrots that appear to have a milky liquid covering or partially covering carrots. If you purchase carrots with greens still in tact, look for greens that are vibrant in color and not too wilted. Store carrots in a breathable bag, or loosely wrapped in plastic, in the vegetable drawer. Avoid storing them in the fruit drawer and especially keep them away from fruits that produce ethylene gas, such as apples, avocados, and pears (which will speed up spoilage). Carrots will keep this way for several weeks. If you purchased carrots with greens intact, remove the greens from the carrots and wrap the greens in damp paper towels and place in a breathable bag of loosely wrap in plastic. Store greens in the vegetable drawer and use within 3–4 days of purchasing. Store carrots in a breathable bag, or loosely wrapped in plastic in the vegetable drawer. 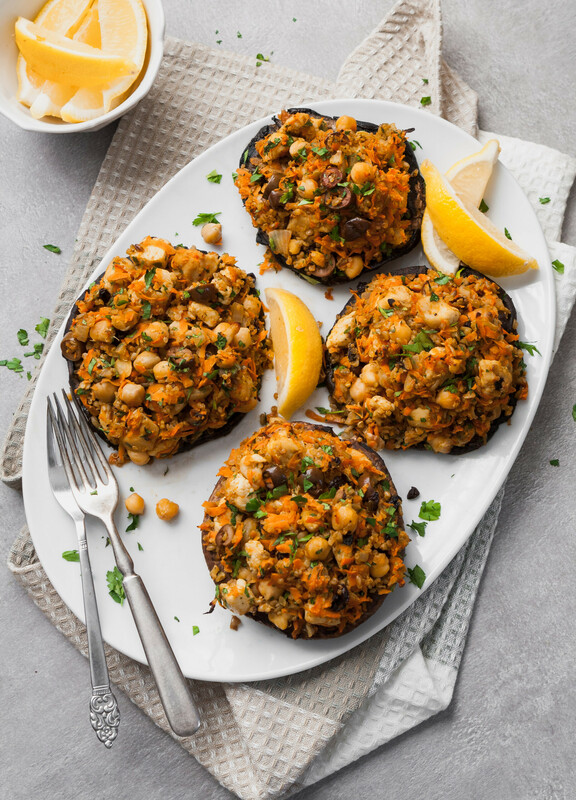 Packed with bold flavors and textures, these Moroccan Stuffed Portobellos with carrots, chickpeas, and ancient grains are not only healthy and satisfying, but easy to make and come together in under an hour—the perfect weeknight dinner! Heat oven to 450°F. Line a baking sheet with foil and lightly coat with nonstick cooking spray. Scrape gills out of mushrooms using a spoon, then arrange portobellos on prepared sheet, upside down. 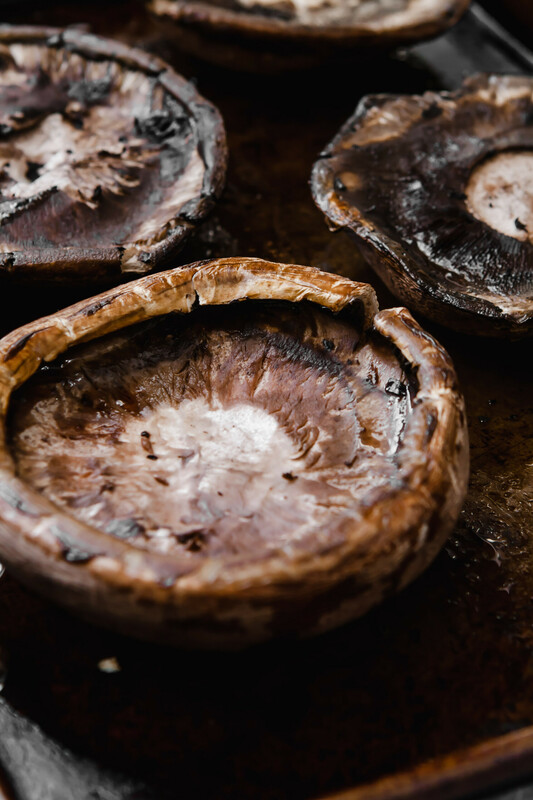 Roast mushrooms until just beginning to soften, about 10 minutes. Remove from oven and let cool on pan. Toast freekah and quinoa in a saucepan until fragrant. Add broth and bay leaf, bring to a boil, then reduce to low, cover and simmer 10 minutes. Stir in currants, cover and simmer 2 minutes more. Remove pan from heat and let stand, covered, for 10 minutes. Fluff cooked grain mixture with a fork, discard bay leaf, and season with salt and pepper. Heat oil in a sauté pan over medium. Add onions and cook until softened, 3 minutes. Add chicken and cook 5–6 minutes; season with salt and pepper. Add carrots, garlic, curry, cumin, and paprika and cook 1 minute. Off heat, stir in cooked grain mixture, chickpeas, olives, and parsley; season with salt and pepper. 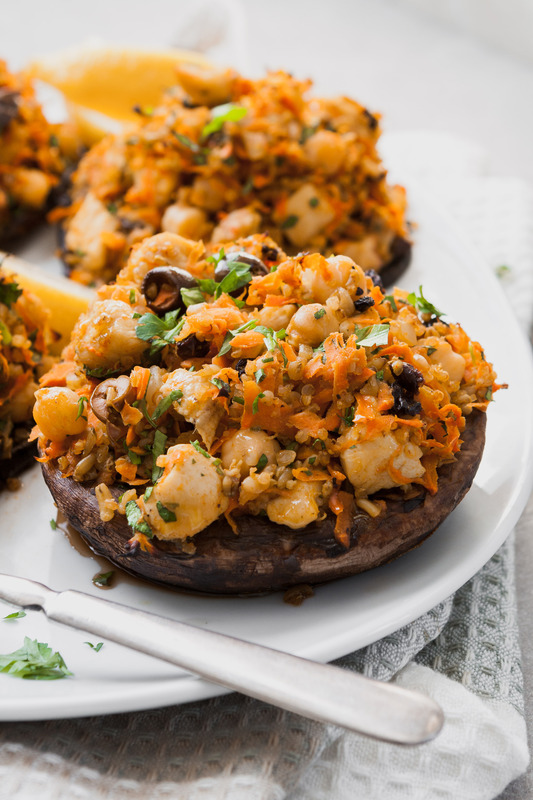 Divide mixture between mushroom caps, arrange on baking sheet and bake until mushrooms are tender and filling is heated through, 15–20 minutes. Sprinkle with additional parsley and serve. 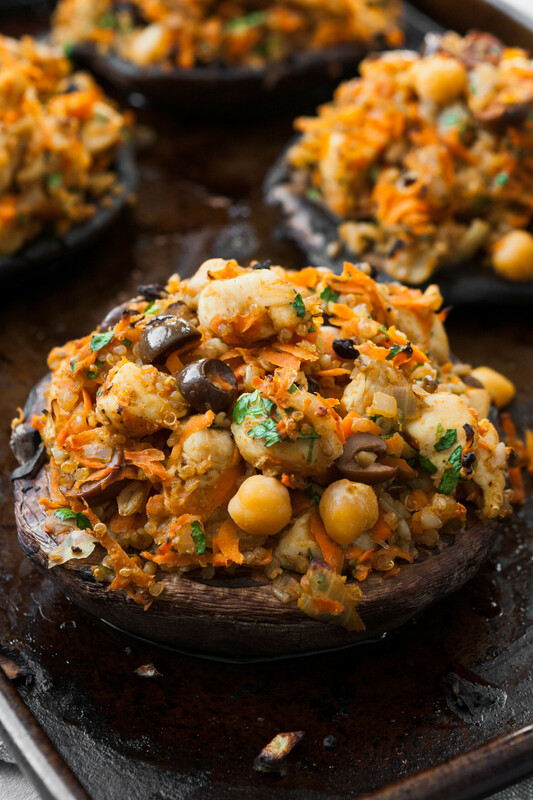 I love the sound of these, a really delicious veggie recipe! Thank you! 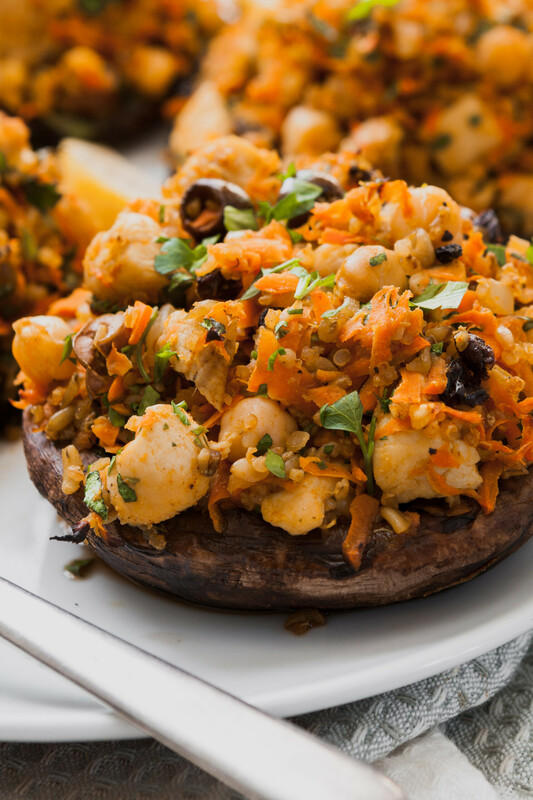 They are a great weeknight dinner!